Set of four Stainless Steel Travel Mugs imprinted with your boat name and port name in full color. Great nautical gift for the boater in your life. Jazz up your java! Why drink your hot beverage out of an ordinary mug when a personalized imprinted mug is so much cooler! Set of four 14 oz. stainless steel coffee mugs with resilient plastic lid, handle, and base. Fits most standard car drink holders. Sleek 14 oz. stainless steel inside and outside. FDA approved. Not dish washer safe. Hand wash only. 1. Wikipedia contributors, "Coffee," Wikipedia, The Free Encyclopedia, http://en.wikipedia.org/w/index.php?title=Coffee&oldid=332404526 (accessed December 18, 2009). Handcrafted - Please allow and additional 3-5 days for personalization. 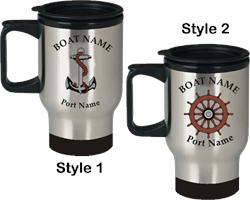 Set of six Personalized Ceramic Mugs imprinted with your boat name and port name in full color. Microwave and Dishwasher safe. FDA Approved. What a great thing. I love my mugs. Thank you for doing a good job!